In association with artsdepot and Centre Point. 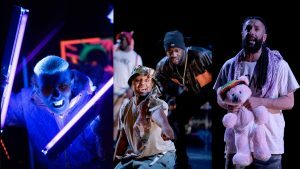 The Concrete Jungle Book is an explosive hip hop musical which catapults Rudyard Kipling’s classic story into inner-city Britain with live rap music, grime, spoken word and high energy physicality. As the jungle’s trees become tower blocks, Mo(wgli) navigates his way through relationships, unstable housing conditions and hostile creatures, trying to find the father figure he has always longed for. This is The Jungle Book like you’ve never imagined. 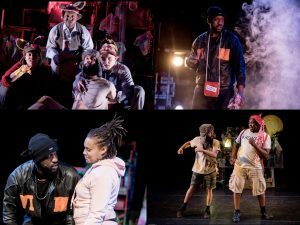 HighRise Theatre have explored ideas for The Concrete Jungle Book through delivering a workshop programme with Centrepoint, the UK’s leading youth homelessness charity. 32 young people aged 16 – 25 have participated in workshops during a year-long engagement project which has informed the development of The Concrete Jungle Book. Following a sell out run at Edinburgh Fringe 2017 and a ton of critical praise, The Concrete Jungle Book is set for a big return in 2018. Watch this space, or get in touch if you want to programme this unique show in your venue. CAST: Dominic Garfield, Joseph Barnes Phillips, Fahad Shaft, Oliver Tunstall, Geler Falconer & Elisha Howe.